Hopefully not - PDB was consistently offered after the UA/HP merger - by both ex-USAir and ex-America West F/A's. the pdb situation is crazy. 100% of the time I get them from the Usair folks. Zero percent of the time I get them from aa folks. No exceptions. 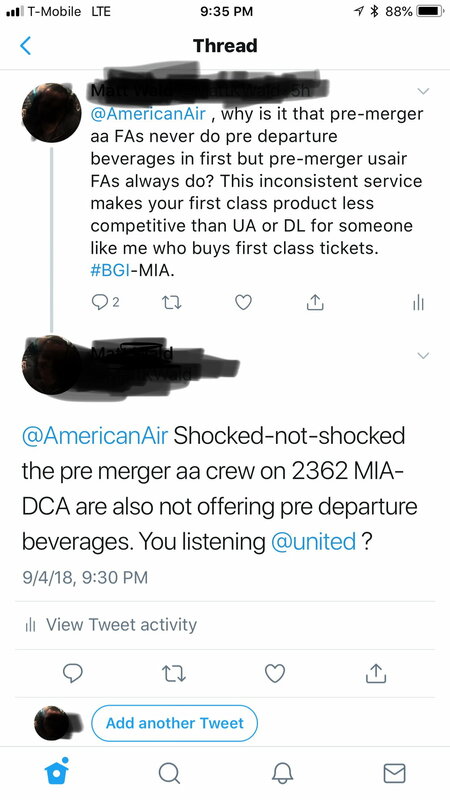 This is clearly not a coincidence and I can imagine us and aa fa’s fighting in the galley over whether to give them or not. Thanks. I just booked my Oct 1 trip on DL F. Should go smoothly. silverthief2 and AANYC1981 like this. Either this will go smoothly and no one will notice or there will be fisticuffs and increased airside law enforcement activity. I suggest that anyone flying that day memorize the lyrics and break out in song, as necessary. Hopefully nothing! But FAs that I've talked to expect at least a little disruption. "A few weeks have passed since the Company presented their new attendance/performance policy with a planned implementation date of October 1, 2018. That same day, they will finally achieve what they have been trying to accomplish since 2015; Full Operational Integration (FOI)...Fast forward to October 1st. The Company will be implementing the full JCBA language on the LUS side which includes TTS/UBL, ETB, ROTA, ROTA-D, JCBA PBS, and Rotating Reserve. On top of all of these changes, we will be navigating through a new attendance policy. Our membership has enough stress and anxiety over the changes coming with FOI and the frustration of dealing with the Company’s IT failures." So, the issue is IT related? Likely affecting scheduling? Honestly, I can't see how the bidding process will change much. Don't most FAs reside close to their domicile or in the alternative, are accustomed to commuting to their domicile? I would be surprised to see much integration immediately, but I could certainly be wrong. I assume this will allow for more flexibility in a/c use. So you won’t really know whether to expect for example a LAA or LUS A319. Lots of people like to hate on CLT but you're gonna get PDB with the US CLT crews. kokonutz, plon, wetrat0 and 2 others like this. Or the LAA FAs "train" the LUS FAs not to do PDBs. The LUS FAs successfully trained the LAA FAs to do credit card pitches, so hopefully the LUS FAs can use the same techniques to motivate LAA FAs to do PDBs consistently. However, the cynic in me says we will get the worst of LUS and LAA - inconsistent PDBs and consistent credit card pitches. There is no spiff given for PDBs. Money talks. I did get tweetbacks with the same old ‘we’ll make sure proper channels are informed malarkey. I was feeling cheeky so asked the FA on the Mia-dca flight why he didn’t do PDAs. He hemmed and hawed about how they are only done ‘if time permits’ and oh my goodness what a harried boarding it was (it was not). But apparently thats the technicality they refer to when called out. Later in the flight he asked me what I did for a living. Still feeling cheeky I said ‘I do quality control consulting for large companies.’ He just kind of stared at me and handed me my refill. Having sat at a hotel bar this evening where there are 2 downroute LAA crews on a layover, all I can say is that they are not looking forward to having both crews merged. Quietly reading my book enjoying my beer, there was no mistaking their comments. In fact, how they openly discussed their colleagues and with such language, it was beggars belief.